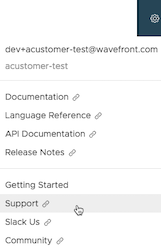 Get help with Wavefront and give feedback. Get in touch with Wavefront by VMware Support from inside the product. Select Support from the gear icon. To give feedback on the documentation, click the Send Feedback link in the footer or post an issue in our GitHub repo.